“Sonny” shopping to steal a car for a crime boss during a Rolling Surveillance course. Photo courtesy of an LE attendee. Our Rolling Surveillance (mobile surveillance), Undercover Field Operations (undercover police training), and Chop Shop Auto Theft Investigations courses are structured for police individuals as well as task force teams. Be sure to check out our testimonials from past attendees. Classes are instructed by a Qualified Expert in the subject matter presented and then taken into the field for hands-on training in an uncontrolled environment. We are hosted and contracted by law enforcement agencies around the country. The lead instructor was a police investigator on task forces working high-profile cases. He has extensive experience and a true understanding for what is necessary to present in the classroom to be used in the field. His knowledge, wisdom, enthusiasm, and energy are apparent as he teaches both in the classroom and hands-on in the field. Many of our trademark classes were originally created out of necessity and demand, when there was nothing like them available. They are now recognized and replicated by other academies, agencies, and private businesses, but without the energy and full comprehension of the original developer, Tim Lewis. Attempting to clone the original is never quite as good, thus the reason agencies continue to return to LCI Services programs. 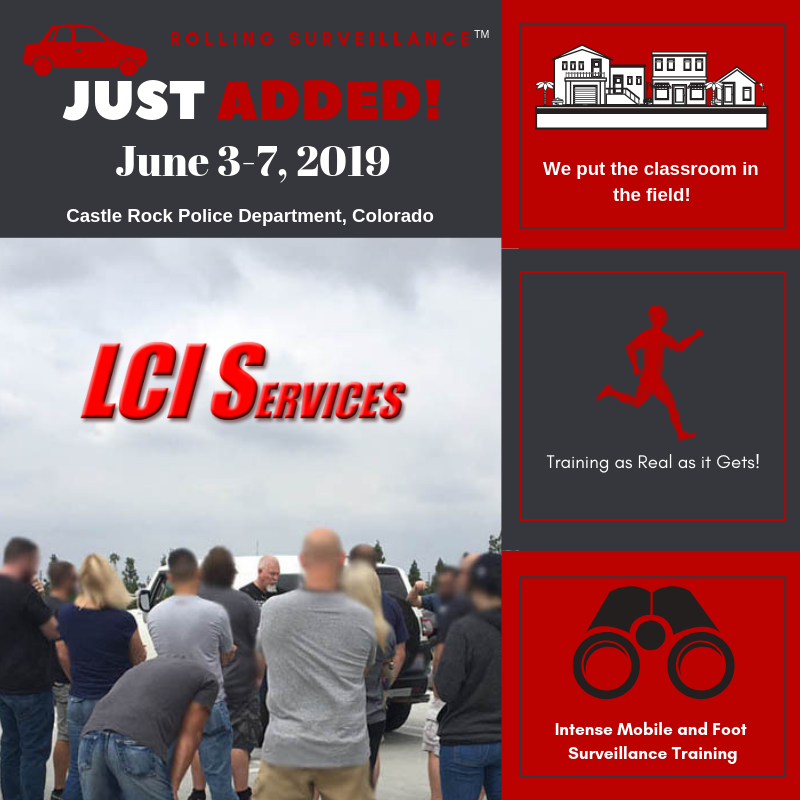 We created and use an effective approach to teaching beginning and advanced mobile and foot surveillance training, responding to counter-surveillance, undercover police operations, auto theft chop shop investigations, and other topics. We provide course materials, hands-on time in the field, a certificate of training, special amenities, and meals. LCI Services offers the original, unique surveillance instruction you’ve been seeking.